My SIL stayed overnight with us after last night's Nutcracker performance and we went to brunch at one of our favorite restaurants, Fog City Diner. After dropping her off at BART, we enjoyed the afternoon to ourselves. I'm still feeling under the weather, so I tried to get rid of the nasty bug to no avail I'm afraid. But that didn't stop me from having dinner w/ our niece who just moved about 3 miles away! I'm super excited to have her nearby! It was nice having dinner w/ her at a nearby Thai restaurant. What?? Did Jimmy actually go with us for Thai food? Yes! He did! He enjoyed a delicious dish of crab fried rice while E and I split some pad thai and spicy chicken. Being with family is the best medicine I can get. 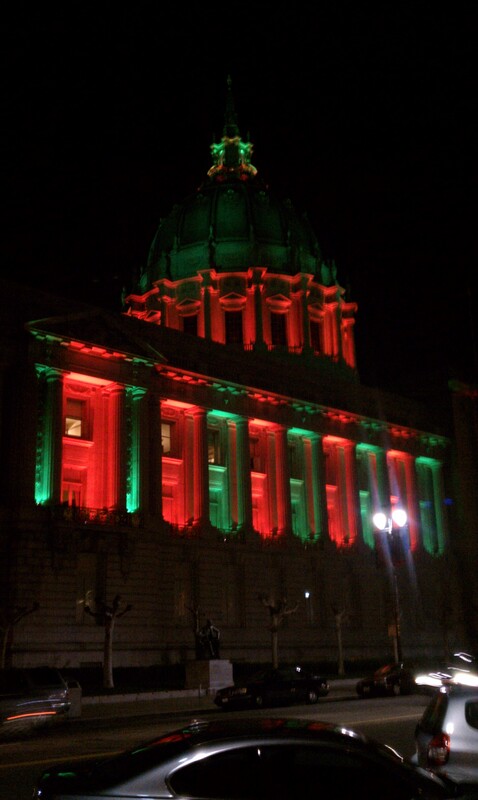 CIty Hall on Van Ness Ave all lit up in festive lights.